Democratic candidate Danny O'Connor, in Ohio's 12th congressional district, speaks to volunteers at his headquarters ahead of Tuesday's special election in Columbus, Ohio, U.S., August 6, 2018. [post_ads]Voters in Ohio and Kansas join those across Missouri, Michigan and Washington state at the ballot box. But only Ohio will send someone to Congress after the votes are counted. Balderson said simply that it was an honor and "incredible" to appear with and be supported by the president. He called the race "very close." 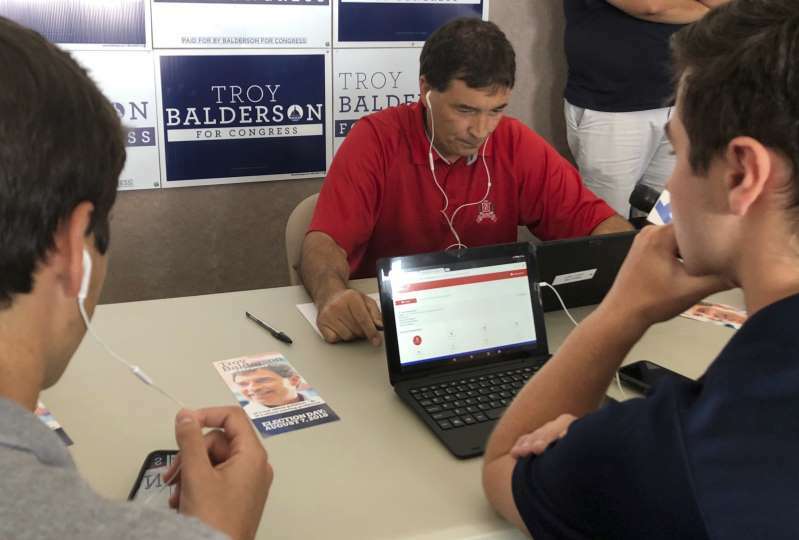 "It's going to be tough, but we feel very positive, we feel very good with the amount of volunteers that we've had here, the enthusiasm, the amount of hours that we've put in," Balderson said. It's unclear, however, whether Trump's support helps or hurts his preferred candidate. Described by campaign operatives as a "Whole Foods" district, the largely suburban region features a far more affluent and educated voter base than the typical Trump stronghold. "They do everything right and, right now in Washington, D.C., no one has their back," he said. "That's about to change in 28 hours, because we are sprinting. We are sprinting through the finish line for this race. We are working so hard because we are part of a movement, we are part of a grassroots movement that is going to change the way politics works." "If he becomes the Republican candidate, he will beat the Open Borders, weak on Crime, Democrat, Debbie Stabenow," Trump wrote. "Vote for John James and Make America Great Again!" Peoples reported from New York. Associated Press writer John Hanna in Topeka, Kansas, contributed to this report.